With her new work, Pieces Of Her, arguably her most heart-pounding standalone thriller to date, this new novel turns the idea of violence on its head. The central question at the heart of Pieces Of Her is, What if the person you thought you knew best turns out to be someone you never knew at all? Andrea knows everything about her mother Laura. She knows she has spent her entire life in the small beach town of Belle Isle, Georgia, and that she has never wanted anything more than to live a quiet life as a pillar of the community. She also knows her mother has never kept a secret in her life. We all know our mothers, but do we really? All this changes when a trip to the mall explodes into violence. Andrea is out celebrating her birthday with her mother at lunch and they find themselves in the middle of a deadly shooting. While this is happening, she suddenly sees a different side to her mother. Frozen in fear as it's unfolding, Andrea sees Laura act calm, cool, and collected and jumps into action to stop the killer in his tracks. How could a middle-aged speech pathologist possibly stop a shooter on a rampage? As it turns out, before Laura was Laura, she was someone completely different. She has been hiding from her previous identity for nearly thirty years, lying low in the hopes that nobody would ever find her. Now Laura has been exposed and nothing will ever be the same. The assailant at the mall was a mentally troubled scion of Georgia law enforcement royalty, and the police are on the search for answers. Laura has been scrutinized at every level of the criminal justice system and her innocence is on the line, but she won't speak to anyone, including Andrea. She pushes Andrea away, insisting it is time for her to stand alone and make a life for herself. Andrea responds by embarking on a desperate journey following the breadcrumb trail of her mother's past. If Andrea cannot uncover the hidden secrets, there might not be a future for either of them. Pieces Of Her is told from Laura's point of view in 1986 and Andrea's in the present day, while asking the question, can you truly escape your past? 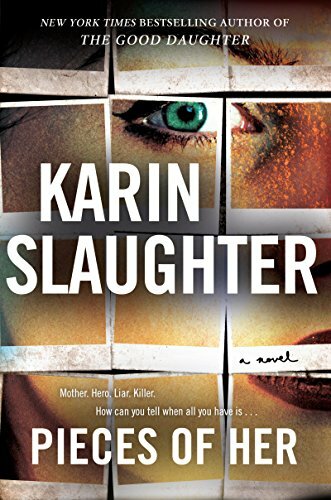 Karin Slaughter has made a name for herself because she has not been silent on the topic of violence, which women have historically been discouraged from talking about. She has been having an honest dialogue about his "hot-button" issue with her readers for almost two decades, and it is the evolution and trajectory of this conversation that has given Karin a unique perspective on what it means to be a woman today. To Karin, silence is acceptance and the idea of not talking about violence makes it okay. After learning about past abuse in her own family, she vowed to shine a light on the subject through her writing. Travelling the world on book tour, she's found that violence against women is unfortunately all too common. Pieces Of Her is filled with fascinatingly flawed characters, masterful twists and turns, and a laser sharp focus on emotional violence rather than physical violence. Karin reminds her readers that life's pain can be experienced in all shapes and sizes. This is Slaughter's most electrifying, provocative, and suspenseful novel yet. Karin Slaughter will be appearing at The Strand Bookstore on Monday, August 20th at 7:00 pm. This is a ticketed event with a Strand gift card. The Strand is located at 828 Broadway at East 12th Street, for more information call (212)473-1452 and visit strandbooks.com. For more information on Karin Slaughter, use #SlaughterSquad on social media.